If you're looking for a vehicle that has plenty of room to fit your growing family, you may already have your eye on a minivan. They are a staple among families for a reason, after all! Minivans are known for being both spacious and safe, giving families the best of both worlds. If you're looking for a minivan that has three rows of seating and plenty of cargo room, we would like to introduce you to the 2018 Honda Odyssey. Wondering how the 2018 Odyssey compares to tough competitors in its class? Wonder no more! We're pitting the 2018 Odyssey head-to-head against one of its toughest contenders: the 2018 Toyota Sienna. Read on to learn all about the features and specifications offered by both! Although the 2018 Toyota Sienna puts up a quality fight against the 2018 Honda Odyssey, with the 2018 Odyssey's extra legroom for passengers and extra seatback storage space, it's hard to outperform the 2018 Odyssey. Plus, the 2018 Odyssey gets one extra mile per gallon of gas* on the highway, despite having a slightly larger engine displacement. 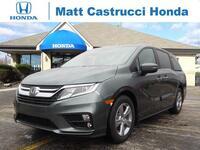 The 2018 Honda Odyssey comes in five trim levels: LX, EX, EX-L, Touring, and Elite. All five trims come equipped with a 3.5-liter V6 engine that has a maximum output of 280 horsepower and 262 pound-feet of torque. And yes, you read that right. The impressive engine comes standard on every trim level in the lineup, meaning you won't have to pay extra for powerful engine performance for even the base trim. Moving inside, the EX, EX-L, Touring, and Elite trims have an 8-inch high-resolution touchscreen display sitting front and center. Additional standard features for those four trims include Apple CarPlay™ and Android Auto™ compatibility, SiriusXM® Satellite Radio, HD Radio, and CabinControl™ Remote Capability. Looking for even more high-tech connectivity and entertainment features? If so, you'll love the Touring and Elite trims, which tack on a standard 10.2-inch high-resolution screen with a Blu-Ray™ player and built-in streaming apps. 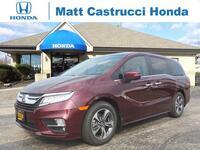 Minivan shoppers looking for additional information about the 2018 Honda Odyssey are encouraged to stop in and see us at Matt Castrucci Honda or contact our team today with any questions! Interested in meeting the 2018 Odyssey face-to-face? If so, don't hesitate to stop into our location in Dayton or schedule an obligation-free test drive online today!